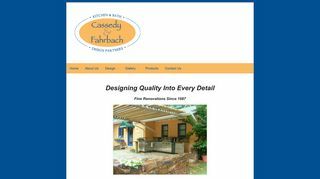 Cassedy & Fahrbach Cabinet Design Inc.
Cassedy & Fahrbach Cabinet Design Inc. – Custom Kitchen and Bath Design Firm located in Chatham County, North Carolina between High Point and Raleigh. – Custom Kitchen and Bath Design Firm located in Chatham County, North Carolina between High Point and Raleigh. Portfolio ideas and cabinet applications.